CSX Corporation is an international transportation company. They offer a variety of transportation services including, rail, container-shipping, intermodal, trucking and contract logistics. It operates in two business segments: rail and intermodal. The rail segment provides rail freight transportation. The intermodal segment provides integrated rail and truck transportation services and operates a network of dedicated intermodal facilities across North America. Know someone who likes trains? 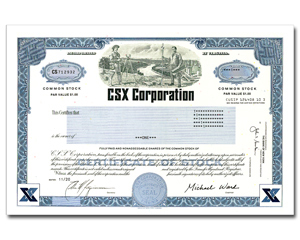 CSX stock gift is a must!